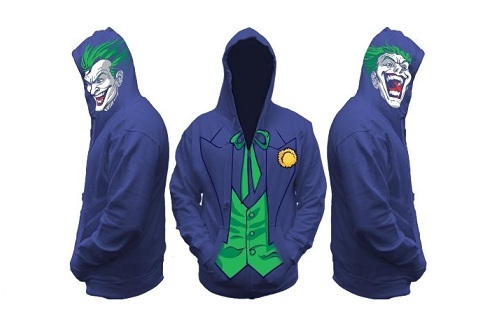 Dress in style like the Joker with this cool Batman Joker All View Zip Hoodie! Purple hoodie features a printed design based on the Joker's famous purple suit, plus the Joker's face on each side of the hood. Roomy, comfortable fit; zip front closure; separate front pouch pockets; drawstring adjustable hood; rib knit trim at cuffs and waist. Adult men's sizes. 80% cotton, 20% polyester. Officially licensed.